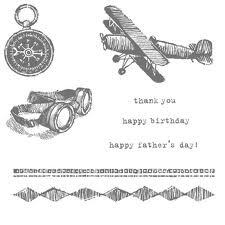 Stampin' Up ideas and supplies from Vicky at Crafting Clare's Paper Moments: Notelets gift set using a Top Note topper. Notelets gift set using a Top Note topper. It's half-term here in Buckinghamshire and I've been on entertainments duty but I did have time to rustle up a quick set of notelets. Come and see! I've been fascinated with the diamond pattern in the Plane and Simple set ever since I first saw it in the mini catalogue. It comes attached to a decorative double line image which I thought I'd like to use separately so I decided to cut them apart with my craft and rubber scissors and mount them on opposite sides of the same block. Today's little notelets have been made with the result of that split. I used one of my favourite colour combinations for these - Old Olive and Marina Mist. I've given the sentiment a bit more definition by using Not Quite Navy, a darker colour that coordinates perfectly with these two colours. I love this diamond pattern! Check out the pattern I made with the double line (Ha! Did you see what I did there?!) It reminds of seersucker fabric! I used my trusty stamp-a-majig to keep the lines straight on all these cards of course. Here's the double line again, used to make a striped pattern this time. The cards are tiny little 3" square notelets - perfect for a hand-delivered little thank you. I popped them, along with some tiny envelopes I had, into a medium cello bag and made a topper out of some Nursery Suite designer paper and the Top Note die. One of the large designer buttons finished the project off. These little sets of notelets make a good gift and don't take long to make at all. I didn't have time today, but I plan to make several more sets with different themes - florals, leaves, trees, animals and of course Christmas. Now, what are you up to this weekend? If you live locally and don't have anything planned, why not drop in at the Bucks Country Fair at Preston Bissett tomorrow? I'll have a Stampin' Up stall there and would love to see you! Thank you as always for spending a bit of your time here with me today and I hope you'll come back very soon. Vicky, I LOVE this elegant set of notecards! I love how you used those patterns to make this great set which would work wonderfully for a man. Such a sweet little set Vicky and I agree a perfect little gift set. I love these stamps from the plane and simple set and you've done a fab job with these designs. Enjoy your craft fair tomorrow. I'm off to my friend Julies Big Shot Hot Shot class! You are so clever, these are lovely. After seeing your cards made with the stitches wheel I bought it and have now got to cut it up.Wish me luck! The visitors to the fair are in for a treat tomorrow that's for sure. Good luck. You're as bad as I am for cutting things up Vicky . . . I cut up my Swiss Dots embossing folder and everybody I told ran screaming from the room at such a scandalous thing! Hee hee! Glad I'm not the ony vandal! Fab notelets by the way! These are just great, Vicky! So simple and great colors, too. Hope you have a great weekend -- and a great day at the fair! Another great idea Vicky! I love the way you present these sweet notes. How do you fasten the top note?